Improving science literacy is one of the goals of the Michigan State University Extension “I Know MI Numbers” initiative. 4-H Science Blasts, held throughout the state, are part of the effort designed to help improve science scores in a state where science literacy for school-aged youth is below the national average. The blasts also help 4-H to reach the goal of engaging one million new young people in science programs by 2013. MSU Extension’s Allegan County 4-H Youth Development was a part of one of this summer’s Maranda’s Park Parties held July 28, 2011, at the Allegan County Fairgrounds. The 4-H area included a 4-H Science Blast with four stations of learning and fun for the 4,900 individuals attending the event. MSU Extension educator Jan Brinn incorporated the 4-H Science Blast into the park party to meet the goals of the I Know MI Numbers initiative and National 4-H by educating youth in science. The 4-H area reached more than 900 youth who not only learned about science and 4‑H but had fun too. The Science Blast included four stations that covered the areas of animal science, plant science, engineering and technology, and environmental science. Youth met a cow up close and personal, took part in 4-H beef science activities, made butterflies using the 4-H “Project Butterfly Wings” curriculum, pollinated flowers using corn meal and made red bean necklaces. They enjoyed watching the TEAM ROCK Robotics 4-H robot pick up balloons made by Giggles the Clown. They even learned about worm farming from a young 4-H’er. Attendees also were able to proudly wear Science Blast tattoos. Jan is excited about the success of the event. “With the large number in attendance, TV cameras and wonderful 4-H volunteers helping in the 4-H area it was very successful. 4-H was promoted, youth educated in science and everyone had fun as well,” she said. 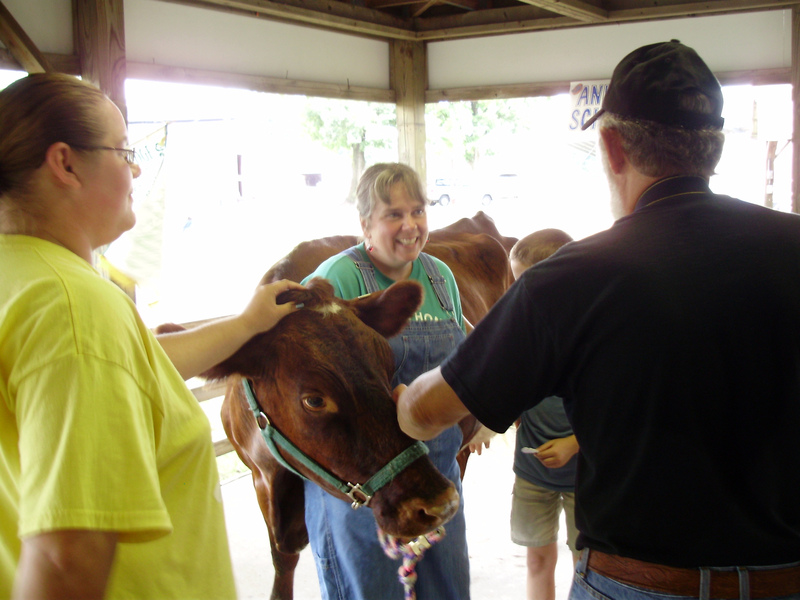 4-H leader Robyn Wixom (center) introduces attendees to Peggy the Cow at the 4-H Science Blast July 28, 2011, at the Allegan County Fairgrounds. Peggy was a great conversation starter that got kids interested and asking questions about animal science. Photo by Janis Brin. 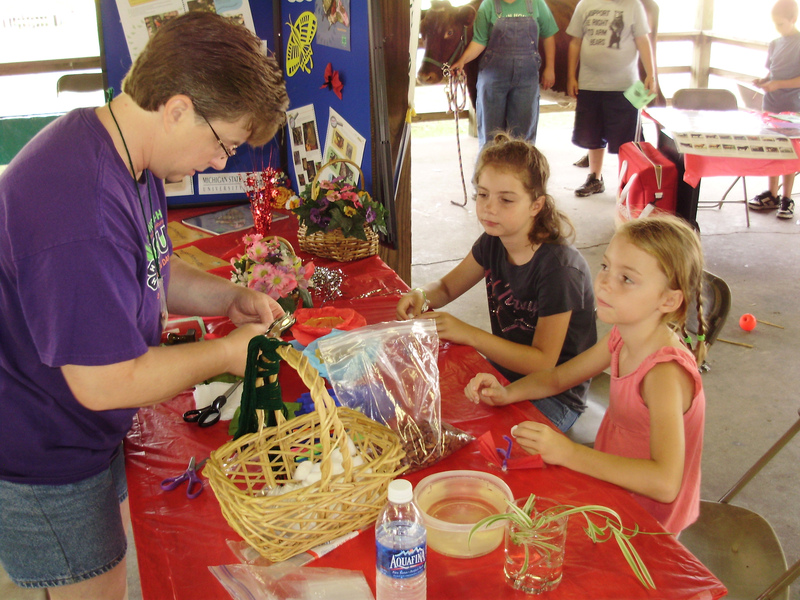 4-H leader Roxanne Henley teaches two attendees how to make bean necklaces and butterflies at the 4-H Science Blast July 28, 2011, at the Allegan County Fairgrounds. Photo by Janis Brin. 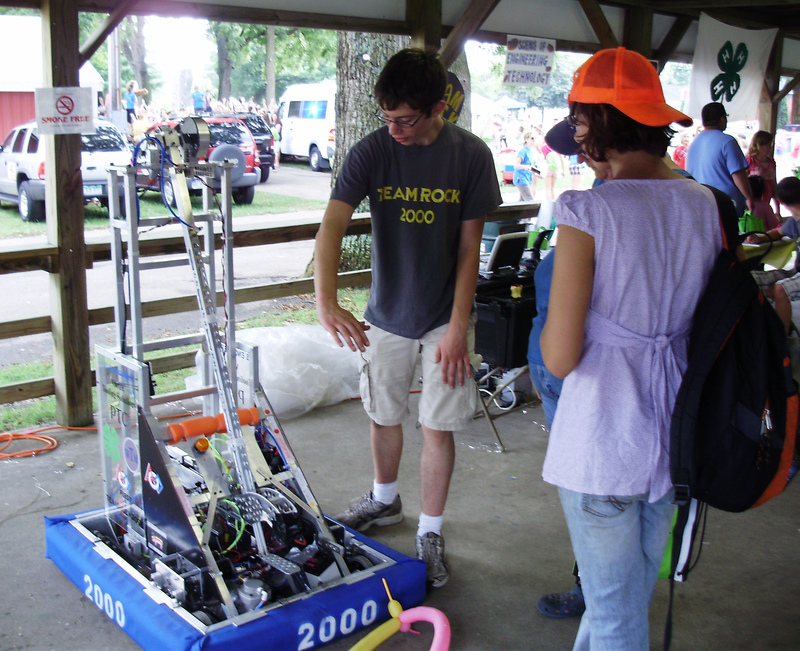 Team ROCK 4-H member demonstrates the Robot 2000 to attentive participants at the 4-H Science Blast July 28, 2011, at the Allegan County Fairgrounds. Photo by Janis Brin. 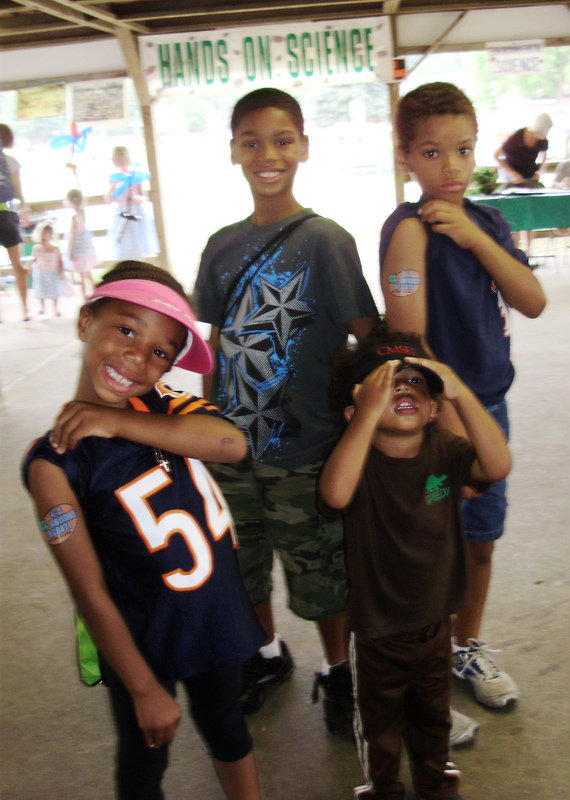 Attendees proudly show their “Science Blast” tattoos at the 4-H Science Blast July 28, 2011, at the Allegan County Fairgrounds. Photo by Janis Brin. Improving science literacy is one of Michigan State University Extension’s targeted programs, part of the “I Know MI Numbers” initiative. It’s also a goal of National 4-H. To address increased demand for science and technology professionals, 4-H is working nationwide to reach a bold goal of engaging one million new young people in science programs by 2013. To help meet that goal, forty-two 4-H Exploration Days participants from Delta and Schoolcraft counties took part in the building and testing of remote operated underwater vehicles (ROVs) at the Great Lakes Naval Memorial and Museum in Muskegon prior to arriving on the MSU campus. A committee of youth planned the Exploration Days side trip and selected the ROV as an activity that they felt had educational value and would interest their peers and help them gain knowledge. 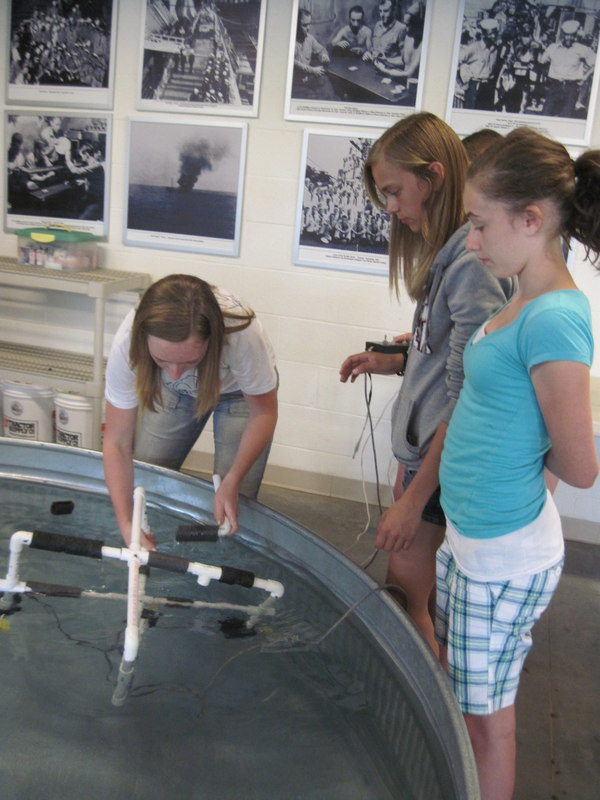 Youth explored and learned about the physics of buoyancy and balance while working in groups of four to design and build their own ROVs. Once they had their vehicles constructed, the groups tested their ROVs in large water tanks and maneuvered them via remote control to move forward and back, make left and right turns, and dive and surface just like real submarines. Delta County Extension educator Dave Radloff explained that the goal was to encourage youth to explore STEM (science, technology, engineering and math) topics and gain a better understanding through hands-on experiences. In addition to the ROV class, participants also spent the night in the USS Silversides, a World War II submarine, where they slept in the same berths as the brave men who once served our country. Delta County 4-H Exploration Days participants also explored marketing and communication, and the use of technology by selling, writing and recording radio commercials to raise funds for the trip. The 27 Delta County 4-H members attending Exploration Days this year created 109 radio commercials. A local radio station, Mix106, graciously donated the airtime to make this 4‑H project possible.